These high quality brochures are suitable for a wide range of purposes, including menus, property details, product literature and much more. They are made from a single, wide sheet (630x297mm) so are ideal for showing off large, high quality images. Printed in full colour both sides, with creasing and folding as standard. You can also specify a laminate finish and paper weights from 170gsm up to a heavyweight 400gsm board. Silk. High quality triple coated paper. For people who are unfamiliar with this type of paper, please note that it is a semi matt finish. Matt with a slight sheen is another way to describe it. Very little light or "glare" is reflected from the surface, making it easy on the eyes when reading. If in doubt - get some samples! You will get a high quality colour print from coated paper, suitable for brochures with a large amount of photographic and graphical content. What about paper weights? Please remember that we are happy to send out samples. If you are new to printing this is well worth while as you can judge which paper type and weight is suitable for your project. This option specifies a thin plastic laminate coating to both sides of your brochure. You can choose either a high gloss, flat matt, or soft touch (matt) laminate. 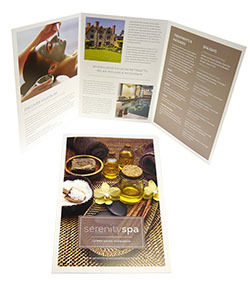 All significantly enhance the appearance and increase the durability of the brochure. You can choose two different types of fold.